LATE King Immanuel Kauluma Elifas of the Ondonga Traditional Authority, who passed away on Tuesday, will be accorded a state funeral, said President Hage Geingob at the Onamungundo Palace today. 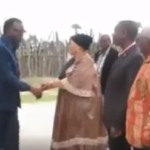 Geingob headed a strong Government delegation that visited the late king’s palace to express condolences and offer help and assistance to the bereaved royal family. He signed the book of condolences and met the widow, Cecilia Elifas, and a select group of the late king’s relatives behind closed doors. Addressing the media afterwards, Geingob described King Elifas as a unifier, a great leader who embraced every one regardless of ethnic or racial background. Founding president Sam Nujoma and former president Hifikepunye Pohamba visited the palace on Thursday. Geingob was accompanied by vice president Nangolo Mbumba, Prime Minister Saara Kuugongelwa-Amadhila, deputy prime minister Netumbo Nandi-Ndeitwah, speaker of the national assembly Peter Katjavivi and several ministers, deputy ministers and regional governors. Meanwhile, senior traditional councillor Naeman Amalwa said in an interview with Informante that the late king will be buried in the royal graveyard at Olukonda on 13 April.